An author, who spoke to Ernesto Serna School’s eighth-graders about a family member’s rise to the high levels of the U.S. government, wants students to plan for their future and understand there are no barriers that cannot be overcome. 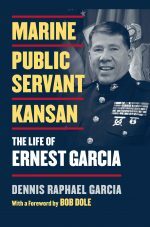 Dennis Garcia wrote “Marine, Public Servant, Kansan: The Life of Ernest Garcia” about his cousin, the grandson of Mexican immigrant field laborers, who went from a being a poor student in elementary and high school to become the first Hispanic sergeant of arms for the United States Senate. Ernest Garcia escorted President Ronald Reagan to the podium to deliver the State of the Union address in 1986. Ernest Garcia rose to be a lieutenant colonel in the Marines before retiring, traveled around the world, met with Pope John Paul, and worked with many prominent politicians. Ernesto Serna School Principal Alejandro Olvera wanted his students to learn from an author with an inspiring story to tell. Ernesto Serna was the first school on Dennis Garcia’s book tour. He also had a book signing at a Las Cruces Barnes & Noble that same day. Olvera loved the immigrant story and the struggles Ernie Garcia overcame. How the Kansas-native didn’t prioritize school, disregarded his grades and almost missed his opportunity for success. He wanted students to understand the endless opportunities afforded to them at school. English Language Arts and Reading teacher Monica Elizondo agreed. She wanted her students to learn to value their education and for the story to, especially, reach those youngsters that don’t like school or claimed to not like it. Eighth grader, Alan Pinal, who earned a free autographed book from Garcia for answering history questions, got the message. He was fascinated with the lecture and hopes to be either a police officer or lawyer. His classmate, Miguel Montoya, said listening to Garcia tell his cousin’s story was amazing. It was because students like those eighth-graders that Dennis Garcia decided to write the book about his cousin, Ernest Garcia.